Organize your clothing with a stylish Ameriwood Home Colebrook 4 Drawer Dresser. Keep your folded clothing such as pants, shirts, or even sheets tucked away in the deep drawers. The paper laminate linen-look inside the drawers and the sturdy dark brown espresso particleboard structure gives this dresser an impressive look when it is accented by the 4 medium brown drawer fronts and copper handles. The Colebrook dresser has a simple, yet sophisticated style for any bedroom. 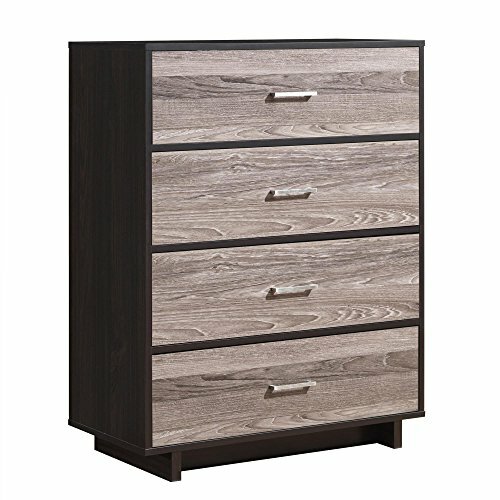 The 4 Drawer Dresser is approximately 39.75”H x 31.125”W x 15.75”D and is best if it is assembled and moved by 2 adults. Two adults are recommended for proper assembly of this dresser. Assembled dimensions: 39.75"H x 31.125"W x 15.75"D. Shipping weight of box is approximately 97.10 lbs.